BBC Spotlight Northern Ireland travelled to the Maldives to investigate the claims against the North Antrim MP. North Antrim MP Ian Paisley, who is facing fresh calls to quit. 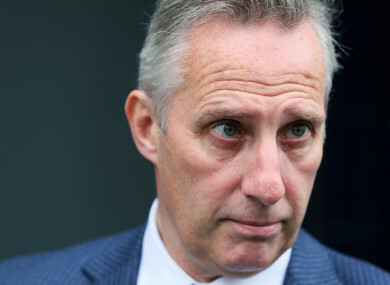 DUP MP IAN Paisley Jr has been placed under pressure from opposition politicians for another holiday scandal. The North Antrim MP has come under the scrutiny of BBC Northern Ireland’s Spotlight programme, which claims he took a free holiday to the Maldives after advocating on behalf of its government. The Maldives, a group of tropical islands in the Indian Ocean, left the Commonwealth after pressure was placed on its autocratic leader to protect human rights among a crackdown on dissent. The revelation follows Paisley’s suspension from the House of Commons for 30 days after he didn’t declare two family trips to Sri Lanka that were paid for by its government before he advocated on their behalf. In the Spotlight programme aired on Tuesday, it said that Paisley travelled to the Maldives with two MPs in February 2016, where he criticised the sanctions placed on the Maldives. In October and November that same year, Paisley returned to the Maldives with his wife and two sons for a family holiday. Spotlight said it had evidence that suggested the visit was requested by the Maldivian government; the holiday wasn’t listed on the register of parliamentary interests. The programme investigated whether the holiday should have been declared. In a statement to Spotlight, Paisley said the family holiday wasn’t organised by the government of the Maldives, and was partly paid for by him and partly by a friend, who he declined to name. Following the revelations, Sinn Féin, the SDLP and the UUP have written to the Parliamentary Commissioner for Standards in the House of Commons, Kathryn Stone, asking her to investigate the claims. Sinn Féin leader Michelle O’Neill said that Ian Paisley should have resigned “many months ago”. …To be at the centre of yet another scandal is not befitting of anyone who holds public office. After Paisley’s Sri Lankan revelations, the chair of the Standards Committee, Sir Kevin Barron, said they had concluded Paisley was guilty of “serious misconduct”. Paisley responded to the Sri Lankan affair in a column piece in the Ballymena Guardian, where he said that the rules he broke were “confusing” and that the letter he sent advocating on behalf of the Sri Lankan government was interpreted harshly. “I’m man enough to accept that the committee has found against me and will have to live with that consequence, however I am equally prepared to point out what will be my proportionate response,” Paisley wrote. Email “Ian Paisley under pressure again for undeclared family holiday to Maldives”. Feedback on “Ian Paisley under pressure again for undeclared family holiday to Maldives”.